If you or I went into our workplace this morning, and started giving serious verbal abuse to a work colleague, making snide, mean, degrading and personal comments, we would be in front of our HR manager or line manager or principal by this afternoon, and rightly so. Bullying is totally outlawed in most reasonable places of work. It's a mean spirited act carried out by people often to try to intimidate their victims, to gain some type of psychological advantage over the individuals they are bullying, or to hide their own limitations and inadequacies. Verbal intimidation of someone in the workplace is not acceptable. Nor is it acceptable on the field of play. In GAA games, especially inter-county games in the past few years, it has become really prevalent and is ugly and nauseous. There is an onus on referees, umpires, linesmen and the players to stop such despicable behaviour. It is nothing new, but it has never been so common and obvious. 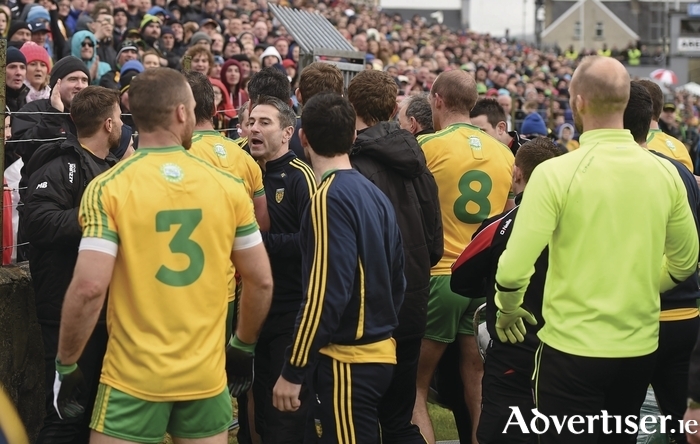 There is a rule within the GAA to stop verbal abuse, or sledging as it is known at all grades. That rule needs to be implemented more frequently. Rule 5.14 of the playing rules of Gaelic football states that to use threatening or provocative language against an opponent is an immediate black card offence. The way that our games are going and, in observing some of the mean spiritedness that is prevalent in many of our games, it is vitally important this rule be implemented both at inter-county and club level to uphold the sportsmanship of our games. If a player is caught engaging in verbal abuse of an opponent, or a teammate for that matter, by one of the officials, his behaviour merits a black card. A loud and clear message would be sent out to the other players involved in the game, or watching in the stand or on TV. Of course it is hard to police, but if the trash talking is particularly obvious and in front of an official, action needs to be taken. If the rule is there, it is there for a reason and needs to be implemented. Some of the things that have been allegedly said on the field of play in an effort to try to win a sporting event are totally despicable and bring nothing but dishonour and indignity on the players involved. Examples include bringing up opposition players' personal lives such as addictions, loss of family members, relationship break-ups, poor performances in the past, or anything that can get up the skin of the opposition player and try to intimidate them and put them off their game. Last Sunday's Ulster championship game was a case in point and the number of verbals going on between players was unsavoury. Three times All-Ireland winner and 2008 player of the year, Tyrone captain Sean Cavanagh, said during the week that comments can go deep. "Down into family history, girlfriends and wives, it gets a bit malicious at that stage "Until referees get help, until sideline officials and umpires start being really brave, and make calls, it's not going to change. It can [the comments] be quite personal and I know certain players have been through tough times, and they were getting a fair bit of personal abuse." Is that the type of behaviour we want in our games? Is it that type of verbal taunting we want the top players in the country engaging in? Surely that is not the example we want for our club U-14s and Ted Webb teams and county minors. The referees need to do their job and use rule 5.14 if required. And players need to reflect too - ask themselves is that the type of behaviour to which they want their children and young club members aspiring? Is it the type of behaviour they will be proud of when they hang up their boots? Are a few victories worth losing your self-respect?